George Herman “Babe” Ruth started his career in 1914 as a minor league pitcher and was sold to the Boston Red Sox later that first season. 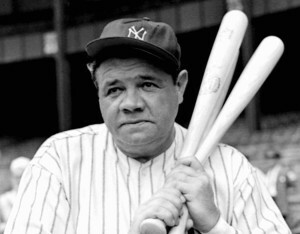 He was sold to the New York Yankees in 1920—the team with which he played through 1934. Known as the “Sultan of Swat,” his record of 60 home runs in a major-league season (1927) was unbroken until Roger Maris’s disputed 1961 record (or Mark McGwire’s undisputed 1998 record). He was the first superstar sports celebrity, as famous for his high-living extravagance off the field as for his performance on it. Ruth was an icon of baseball and one of America’s most beloved sports figures.